If you're looking to up your fruit intake, consider incorporating 100 percent fruit juice into your diet. Concord grape juice -- the dominant type of grape juice on the market -- and cranberry juice both fit into a healthful diet, and both juices offer nutritional value in the form of phytonutrients and vitamin C. However, cranberry juice offers additional vitamins not found in Concord grape juice. Concord grapes and cranberries -- and their respective juices -- contain resveratrol, a beneficial phytonutrient. Like vitamin C, resveratrol acts as an antioxidant. It also plays a role in cancer prevention, explains the Linus Pauling Institute. Resveratrol helps control healthy cell growth, promotes apoptosis -- the planned destruction of old or damaged cells -- and regulates liver enzyme activity to reduce the level of carcinogens in your body. Including more resveratrol in your diet might also promote cardiovascular health -- it reduces harmful inflammation and promotes healthy blood vessel function. Concord grape and cranberry juices get their vivid hue from anthocyanins -- blue, purple and red pigments that offer nutritional value. Anthocyanins work in combination with other nutrients to offer antioxidant protection for your tissues, and a diet rich in anthocyanins is associated with better vision, a lower risk of neurodegenerative diseases and better cardiovascular health. They might also fight cancer -- anthocyanins help control cell growth to prevent uncontrolled cell proliferation, and they prevent angiogenesis, a process that would otherwise increase blood supply to growing tumors. Cranberry juice and some types of Concord grape juice both offer ample amounts of vitamin C. Bottled grape juice naturally contains just trace amounts of vitamin C -- less than 1 percent of your daily needs -- so some food manufacturers add vitamin C to increase its nutritional value. A 1-cup portion of grape juice with added vitamin C contains 63.2 milligrams -- 70 and 84 percent of the daily vitamin C intakes recommended for men and women, respectively. 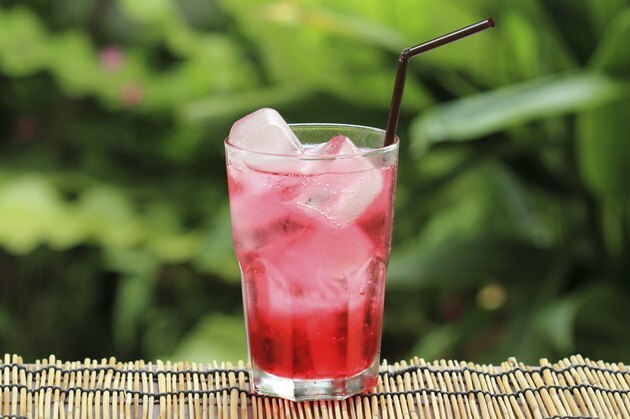 Cranberry juice naturally contains vitamin C -- each cup offers 23.5 milligrams. A powerful antioxidant, vitamin C acts as a safeguard to prevent cellular damage caused by toxic free radicals. It's also important for enzyme function, including enzymes that help form bile salts and allow you to make collagen, a key component of connective tissue. While both juices have a place in a healthful diet, cranberry juice has some health benefits not associated with grape juice. It's a good source of vitamin E, offering slightly more than one-fifth of your daily vitamin E needs, and it's packed with vitamin K -- each cup contains 10 percent for the K needs for men and 14 percent for women. Vitamin K helps you form blood clots and maintain healthy bone tissue, while vitamin E's antioxidant function combats cell damage.